My dad harvested this main frame 8 point with a 3" drop tine on his right side. The deer was killed on Thanksgiving morning around 10 am at approximately 115 yards. He was using a Thompson Center Icon 300 Win Mag. The buck field dressed 160 lbs. and was aged at 3 1/2 years old. 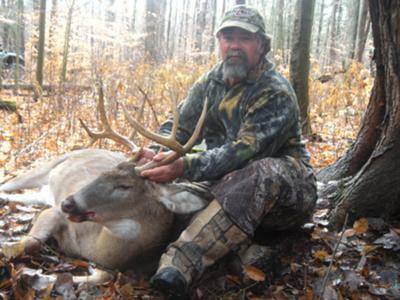 This is my dad's biggest buck to date gross scoring approximately 125".